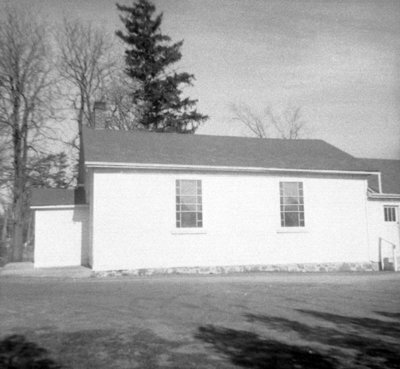 A black and white photograph of Almonds Methodist Church. View is of the side of the church. The land for this Methodist Church on the south side of Highway 2 was given by James Almond, a neighboring settler. The church was served by traveling preachers until it was taken over by the Ministers from the Whitby Methodist Tabernacle. In later years, Almonds Church had its own Minister. It became a United Church in 1925 and was closed in 1971 when its congregation joined with St Mark's United Church. The Almonds Church wad demolished in 1977. Almonds Methodist Church, April 6, 1969, Brian Winter. Whitby Archives A2013_004_083.